Close the eyes and relax all the muscles of the face. Slowly open the eyes and look forward at a steady point. Keep the head still and direct the gaze upwards and inward. Focus both eyes at eyebrow centre. Hold for as long as comfortable and release at the slightest sensation of strain. Close and relax the eyes. 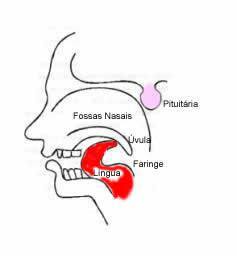 Fold the tongue back and up, so that the lower surface lies in contact with the upper palate. Stretch the tip of the tongue backward as far as comfortable. 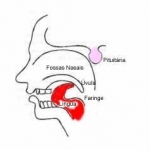 Practice Psychic breathing (Ujjayi pranayama). Hold this mudra for up to 5 minutes, or as long as appropriate. Once complete, release and relax the tongue. 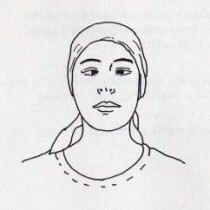 Keep the head still and direct the gaze to the nose tip. Practice for up to 3 minutes. 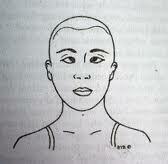 Place the right index finger and middle finger on the eyebrow centre. 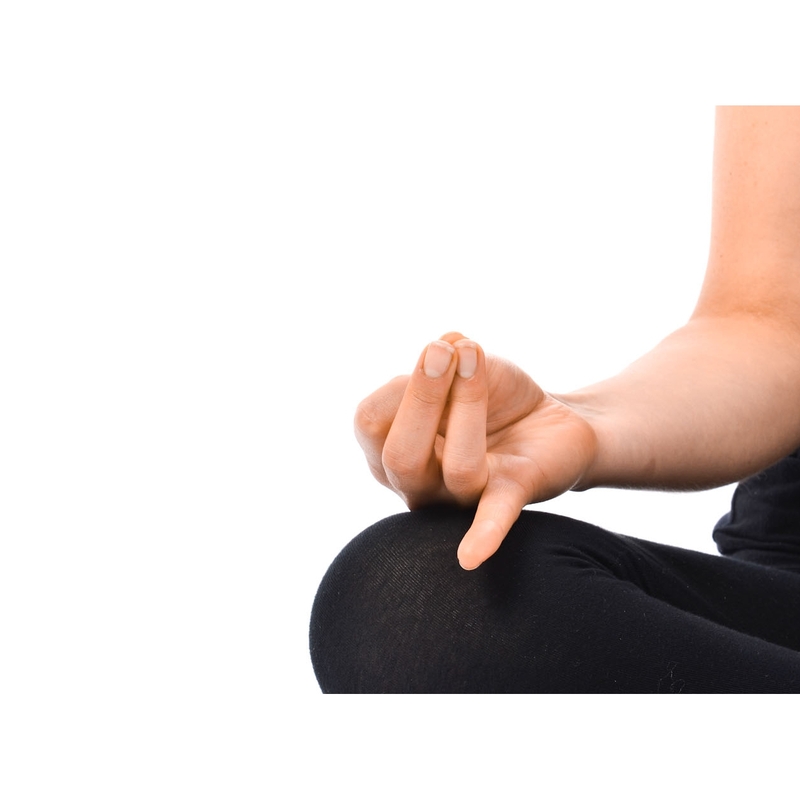 Position the thumb above the right nostril and the ring finger above the left nostril. Have the little finger comfortably folded. Rest the left hand on the left thigh, alternatively use it to support the right elbow. Curl the index fingers to the base of the thumbs. Join the tips of the middle and ring finger to the tip of the thumb. Straighten the little finger in a relaxed way. Place the hands on the knees with the palms turned up. Place the back of the right hand on the palm of the left hand. 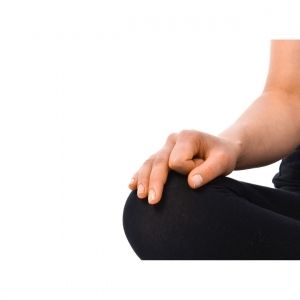 With both palms facing up, rest the hands in the lap. 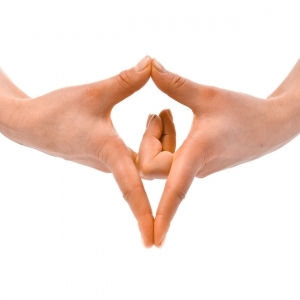 Bring the backs of the hands together, with the fingers pointing toward the body. Interlace the little, ring and middle fingers together. Join the pads of both index fingers together and the pads of both thumbs. Point the index fingers away from the body and thumbs towards the body to form a diamond shape. Join the tips of the thumb and the index finger together, or curl the index finger to the base of the thumb. 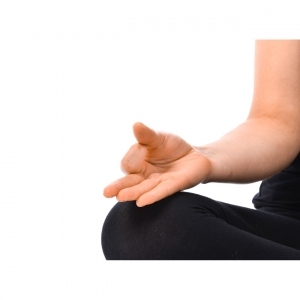 Straighten the other three fingers in a relaxed way. Join the tips of the thumb and the index finger together, or curl the index finger to touch the inside root of the thumbs. Place the hands on the knees with the palms turned down.